The show gets up to speed quickly and starts out promising. But then everything set up is squandered. Rather than develop characters they're just killed off, and by halfway through it's clear that it's just one long diablos ex machina. The obvious comparison for this is Madoka, but unlike Madoka this series has no understanding of what makes tragedy work. Madoka's world is unfair, but characters mostly dig their own graves. Here... characters get killed off and suffer because that's the sole purpose of the show. And also unlike Madoka, there isn't any resolution in the end. The characters get brought to their lowest point... and then that's it, cut, wrap, series over. To be honest, this doesn't even really have a climax. To borrow a phrase, it's watching a train wreck in slow motion and the train is filled with children and it's happening because the author likes that kind of stuff I guess? At this point you might be thinking, "Oh no! Genco is ripping off Aniplex!" Or a more forgiving but still skeptical, "Wait, a spiritual successor to Puella Magi Madoka Magica? No way will it measure up to the original." However, this series does me as many unique favors in it's pilot alone as my previous favorite "Magical Girl" anime. In fact, it does me quite a few more favors than most. If you could play a mobile game with a 1:10,000 chance of becoming a real magical girl, would you? Of course you would. But would you read the fine print in the Terms of Service? Probably not. This series seems prepared to stand on its own, relying on inspiration from video game mechanics more than inspiration from previous "Magical Girl" anime. I had no idea this Autumn would be so exciting. The comparison to Madoka is a bit too easy. However, the similarities stop around "Dark Magical Girl anime". Like Battle Royale or Game of Thrones, it has no problem killing characters you thought had to be immune. Many seemingly weak characters end up surprisingly strong, and much of the overpowered magic has a weakness to be exploited. I enjoyed watching the evolution of certain characters' mindsets as the game they were playing grew more and more brutal. I think also that a lot of the low reviews are very justified. If you don't want to watch cute girls (sometimes as young as 10) murder each other (sometimes in cold blood) then well.... yeah don't bother. When in a death-game, hire a bodyguard and cry in your room until everyone else dies. This show has a handful of abilities and ideas that are interesting and fun, but the story is predictable. Most of the cast's deaths are foreshadowed by their entire backstory being delivered in flashback scenes shortly before their demise. The antagonists' actions are clearly designed to result in the death-game plot of the show but don't actually make sense when considering their supposed purpose/goals. The protagonist survives to the end by never fighting anyone. Watch this if you want to watch a show specifically about magical girls murdering each other. 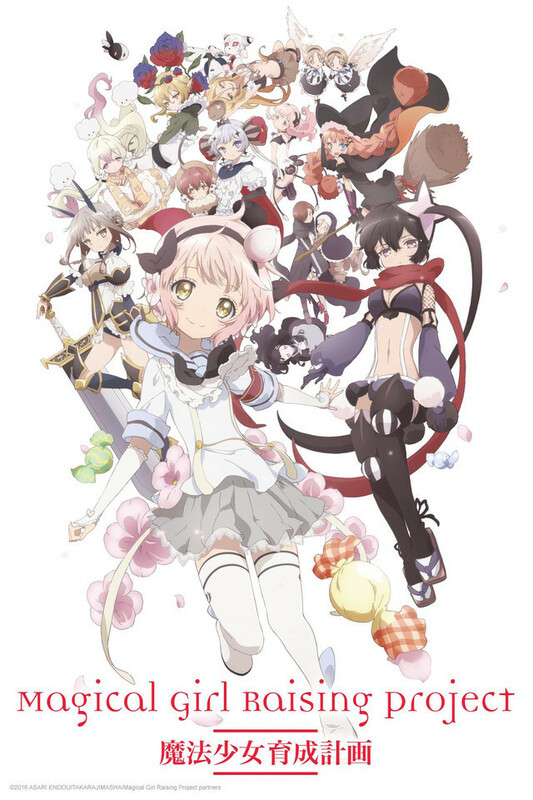 Mahou Shoujo Ikusei Keikaku is the follow up to the success of Madoka Magica and was meant to kind of ride off the hype of this new genre of "Rogue Magical girls" that Madoka Magica proved could have a place in the anime industry. Well I think Magical Girl Raising Project was really exciting, fun and unique, I don't think the story or characters were all that good. Magical Girl Raising Project just felt rushed in a few areas such as story and character development. The real problem I have with this anime is that none of the characters are able to get any real character development due to the anime only having 13 episodes... This is where the underlying problem in the anime comes from, they aren't able to make the characters likable enough that you actually start caring when they kill off or threaten to kill off your favorite character. If this anime had maybe about 24 episodes or so it definitely could've lived up to Madoka Magica but since there was such little time no character development ever happened in this anime, which is why this anime just didn't seem as good compared to Madoka Magica. Don't get me wrong it was still good, but there was so much wasted potential because this anime was only able to get 13 episodes. This genre is gonna be one of those genres that if a series doesn't get more than 22 episodes, they're gonna have a hard time being considered "good" no matter how nice the animation and original the concept is. Because in order for an anime all about killing off fictional characters to be successful you have to be able to create a bond between these characters and the viewer, having only 13 episodes means that if you want to kill off lots of characters and have an actually decent story you're going to be rushed and have to spend less time creating this bond, which was why Magical Girl Raising Project was unable to live up to Madoka Magica. Everything about this anime was really good, the animation, the fight scenes, the plot. However the characters just weren't developed enough for me to even care about any of them and well their deaths were "sad" so different reasons, I just found myself shrugging it off like "Eh they were a boring character anyway." Kill one stalwart, young, would-be heroine, and the audience gasps. Spend a season mulching a flock of them, and that initial shock decays into tedium. MGRP's biggest problem is that we don't get to know its sacrificial lambs beyond a few basic (and predictably poignant) character traits, so the near-constant wallowing in their angst and suffering feels pointless. Absent emotional stakes, the show's repetitive structure and one-note miserablism become a numbing grind. Beneath the secondhand plotting, it's little more than a sad-cute meatgrinder: too cynical to reach the viewer's heart, and too sadistic to offer much entertainment value. Despite containing the words Magical Girl in the title the magical girl qualities of this show are shallow and perfunctory. It's indistinguishable from a shonen anime with character designs that range from fashion crime to ugly and every aspect of this show as an adaptation is a rushed mess which is amazing considering the original book was even more rushed and inconsistent. Obvious ripoff of the popular dark magical girl genre starter, Sailor Moon. Fans of Future Diary and Danganronpa rejoice, you've found your new fix. This anime is beautifully animated and the story/fight scenes are exciting and fun. The powers are designed intelligently and the way characters use then in battle to their full potential is wonderful (but not brilliant, except Swim Swim), I found the maincharacter was kind of... totally useless though. You don't bond with her nearly as much as the other magical girls and her power is new used as best as it could be. On top of that she's kind of an annoying pansy with a not so great design and very little development (Nemurin has a bigger influence). However, the other characters are very likeable, well designed, and their personalities and fights are very pleasing. I would totally recommend this to friends (and I have been), not for the (crummy) main character, but for all the other characters and general death match feeling. 7.9/10 would watch again. This show starts off pretty strong albeit cluttered. Its enough to draw you into the world and its characters, but when this anime starts to hit its stride is where the seams seem to show. It builds up towards the end but it putters to a stop. If you're looking for the next madoka this is not it. My favorite character was killed off. Terrible show, though it had so much promise. I just think it's such a let down...I hate to give it such a bad review, but watching magical girls murder each other really ruined it for me.